The Accelerated Dragon features an early g6 by Black. An important difference between this line and the Dragon is that Black avoids playing d7–d6, so that he can later play d7–d5 in one move, if possible. Black also avoids the Yugoslav Attack, but since White has not been forced to play Nc3 yet, 5.c4 (the Maróczy Bind) is possible. 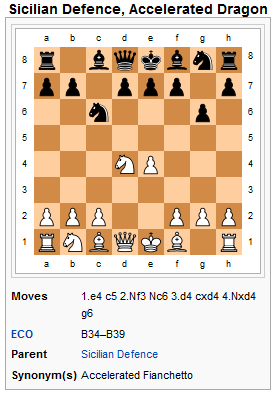 The Accelerated Dragon generally features a more positional style of play than many other variations of the Sicilian. @Terminator-I wrote: Interesting moves ! I agree! I really like how this book was put together.